This is the perfect bouquet for the bride that likes a little sparkle. Assorted lavender roses and pale lavender spray roses are surrounded by an iridescent bouquet collar displaying tiny rhinestones. 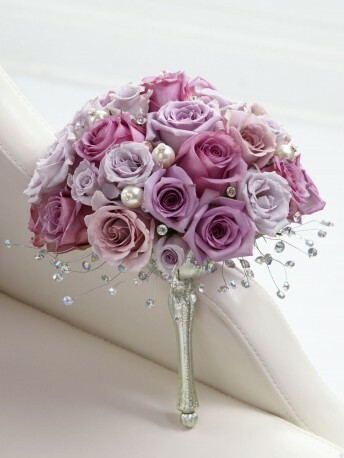 Accented throughout the bouquet with pearl pins and jewel pics and presented in a silver metallic bouquet holder, this arrangement is truly unforgettable. Approx. 12"H x 11"W.